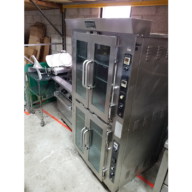 7-14ML - USED ALTO SHAAM COMBITHERM OVEN INCLUDES FREE SHIPPING - Delray Food Service Equipment & Reconditioning Inc.
Cook a wide variety of food with the perfect cooking method using the Alto-Shaam Combitherm Proformance gas boiler-free combi oven! This combi oven features steam and convection cooking modes to accommodate nearly any food, while the combination setting lets you thoroughly cook food much faster than steam or convection alone. To give you the best cooking performance possible, this combi oven is made according to Alto-Shaam’s CT Proformance standards. The intuitive PROtouch touch-screen controls make it easy for you to adjust cooking conditions in your oven The crystal clear readout can display messages in a variety of languages for clarity, while the on-board memory can store and organize hundreds of customizable recipes. A removable core temperature probe accurately relays the interior temperature, and the three power modes help conserve energy during your off hours. A moister injection feature helps you keep a fine sheen and curst on baked goods, and for long-term cooking, the Delta-T feature lets you cook at lower temperatures for roasts. And thanks to its CombiClean PLUS automated cleaning system, you can be sure this oven will stay clean and sanitary. A PROrinse retractable hand shower gives you manual control over water and moisture, and the built-in SafeVent system automatically disperses built-up steam at the end of a cooking cycle. Built-in LED lighting illuminates the interior at all times, and to help keep your oven sanitary, the door has a self-draining drip tray for grease and run-off. This combi oven’s exterior is made entirely of stainless steel to ensure long-lasting durability, and the CoolTouch3 triple pane window on the door gives you the full view of your food while keeping the interior properly insulated. The Zero Clearance system maximizes your floor space while protecting sensitive temperature components and controls, and with its adjustable stainless steel legs, you can be sure this unit is reliably stable.